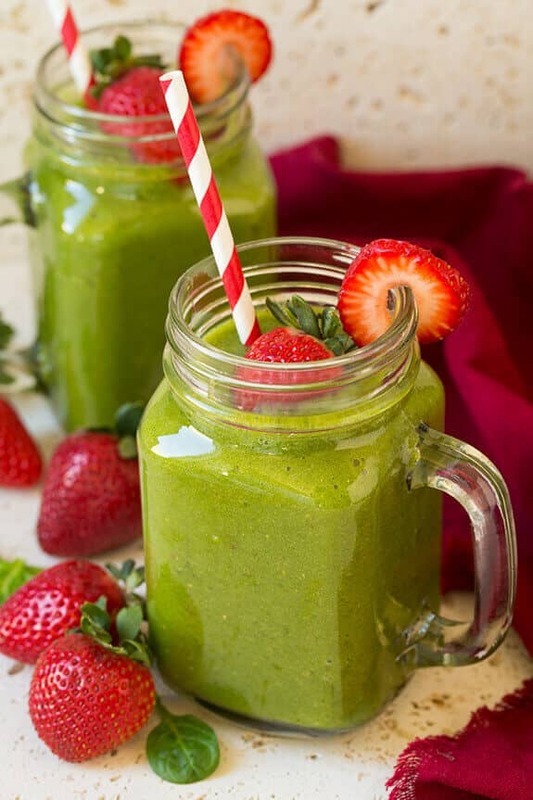 Breakfast is the most important meal of the day, and waking up to blend some nutritious and delicious breakfast smoothie recipes is an awesome meal option that will make your day. By now we all know research suggests that having breakfast is good for our overall health. It helps control our weight, improve concentration and performance at work or at school, and jump-start our metabolism. But at times, our busy schedules don’t allow for elaborate cooking first thing in the morning. This is why having some great breakfast smoothie recipes handy can make the difference between a frazzled, rushed morning and a calm, efficient, and delicious start of the day. Not only there is no need for cooking, but it is also a meal in a cup that is easy to take with you when you’re running a little late. The great thing about smoothies as breakfast is their versatility. You can add fresh fruit or vegetables, make it low-calorie or indulgent, high protein or fiber-rich, dense or light, sweet or tangy, you name it. All you need is a blender or a food processor, and some inspiration as you begin your day. The best breakfast smoothie recipe ideas will all have one thing in common, and that is a good balance of ingredients. All smoothies need a liquid base. This can be water, plain or flavored milk, yogurt, cream, fruit juice, or even a non-dairy alternative such as soy, nut or coconut milk. You will also need ice, or some frozen fruit or juice. Adding a fresh ingredient such as fruits or vegetables is an awesome way of helping you hit your five a day healthy requirement as you start your day, but you can always blend in protein powder or powdered vitamins, as well as any other delicious and wonderful additions such as peanut butter, coffee, tea, chocolate, caramel, granola or oatmeal. There is a bit of an art to blending breakfast smoothies, but it is an easy one to master. All you need is to follow your smoothie recipes closely regarding the ingredients’ amounts, but also their order. Adding the liquids first will ensure that all the other ingredients will reach your blender’s blades in order to mix together smoothly. Watch the speed of your blender, and remember that starting at a low speed might be best in order to gradually achieve the level of thickness you prefer. What could be better than starting your day by indulging in a silky blend of chocolate, peanut butter and banana? And get this, it’s actually good for you! This sinfully delicious, yet healthy shake gets its sweetness from ripened bananas and is easily conjured up from ingredients you probably already have on hand. There’s an autumn chill in the air, and those fragrant holiday pie spices — cloves, cinnamon and ginger — smell oh so tempting. Stop! Put down the fork, step away from the pumpkin pie and run to the blender, instead. This healthy smoothie recipe lets you indulge in the yumminess of the season without racking up the calories or the guilt. How about some chocolate on chocolate on coffee? This amazing breakfast smoothie will jolt you awake and satisfy your sweet tooth, all at the same time. Vanilla Greek yogurt gives it a distinctive lusciousness — think rich chocolate milk with a grown-up coffee twist. The good news is that it’s as simple to make as it is delicious. Elvis, this one’s for you! The classic combo of peanut butter and bananas aren’t relegated to Southern sandwiches anymore. This tasty duo is ideal for crafting an ultra-killer smoothie that is chock-full of healthy carbs and protein. 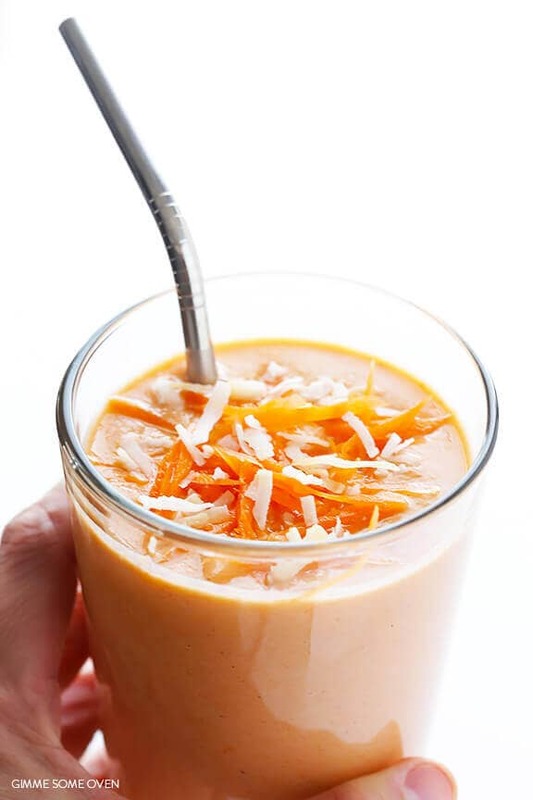 It’s not too sweet, and yields a creamy concoction that will liven up anyone’s smoothie diet. Smoothie diet, meet upscale coffee house. Upscale coffee house, meet smoothie diet. This intro begat something special, indeed — the salted caramel mocha protein shake. 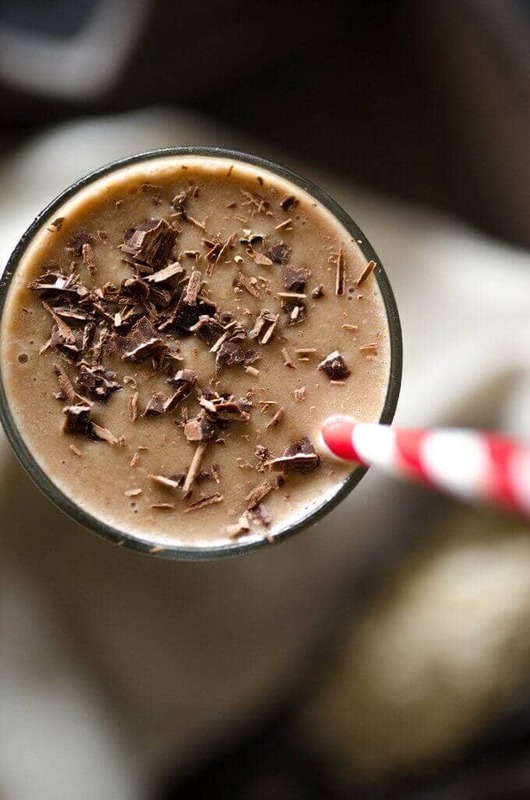 Savor all the pleasure of a barista-crafted mocha, but in a healthy shake form. It’s even amped up with a salted caramel drizzle. Yeah, you heard right … salted caramel, the yummiest culinary craze of 2018. What tastes just like an oatmeal cookie, but is a healthy and light indulgence you can drink through a straw? Give up? 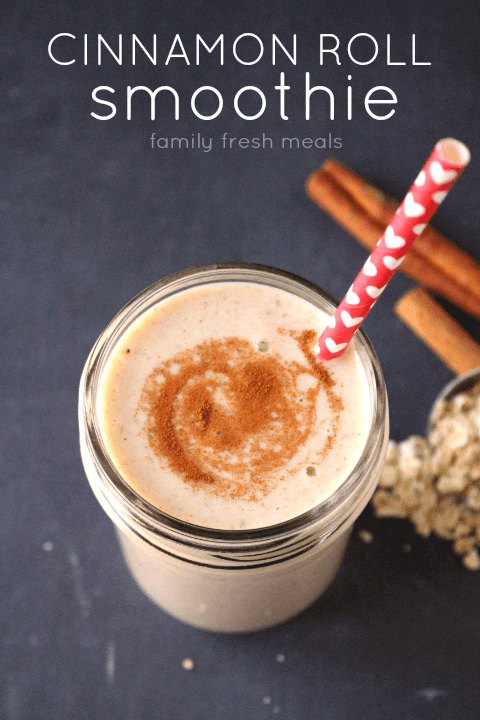 How about a skinny oatmeal cookie smoothie? This is the real deal, folks. A guilt-free smoothie that manages to combine all natural ingredients into something that tastes like a dessert. Perfecto! Hold up. Strawberry and spinach … together? Like for real? These two superfoods make fast friends along with some fruity costars in this healthy and delicious power smoothie. That’s the good news. The even better news is that it’s low calorie and a perfect smoothie recipe for weight loss. So get those skinny jeans on deck, pronto. Anyone serious about a smoothie diet learns to accept that decadent baked goods are relegated to the no column … until now, that is. This smoothie has all the spiced goodness of an ooey-gooey cinnamon roll, but without any of the painful regret. Save this recipe for when you’re desperately craving a sweet dessert moment. This protein shake is all about the peanut butter and banana, but also has just a hint of chocolate. It’s light and wholesome and the perfect something quick to enjoy after a workout at the gym. At just over 200 calories, this shake is a good candidate to be one of many go-to smoothie recipes in a healthy person’s arsenal. Super thick and creamy, this is one of those smoothies you’d swear was a dessert in disguise. It’s simple to create, totally satisfying and makes a great breakfast, lunch, dinner or snack. Why is it so thick and delicious? Hint, hint — it’s all about the oats and bananas. Just don’t tell anyone! You’ll just about feel the tropical island breeze tousle your hair as you take a sip of this cool fruit smoothie. It tastes as good as it looks, and the little flakes of coconut set this smoothie apart from the rest. Refreshing, healthy … treating your body well never tasted so good. Remember all those years ago when lunch used to be a sticky peanut butter and strawberry jelly sandwich? Take a trip down memory lane and experience those same flavors in this amazing smoothie. Its simple four ingredients come together in no time and will reawaken that little kid inside of everyone. 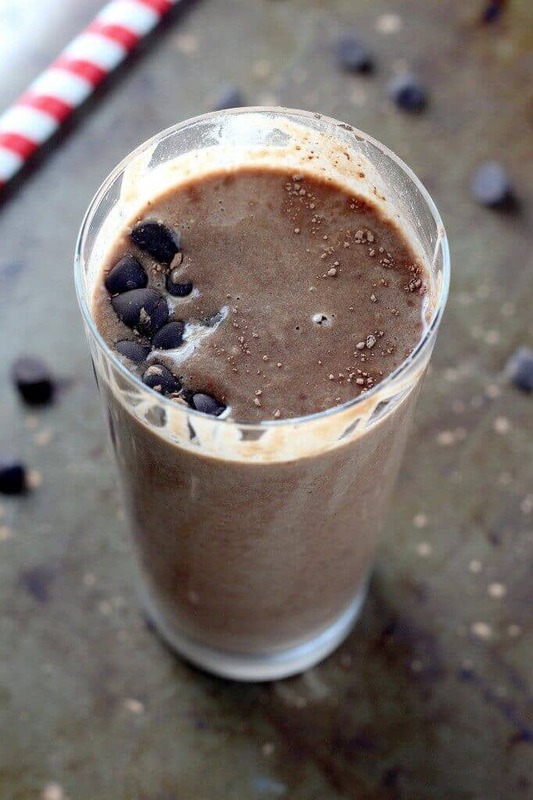 A low-calorie brownie batter smoothie? That’s right, kids, this one’s the real deal. Think chocolate creaminess that is jam-packed with nutrients and protein, perfect for a mid-day recharge. 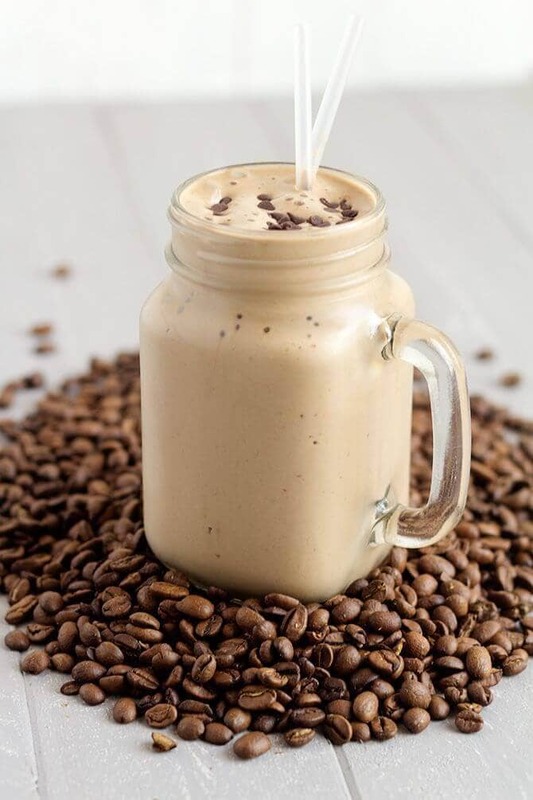 The touch of espresso deepens the rich flavor, making this not only a smoothie recipe for weight loss, but one of the best smoothies around for chocolate lovers. Light and fruity, this smoothie tastes like good ole summertime in a glass. Take a long sip and cool yourself down after that crazy intense workout. 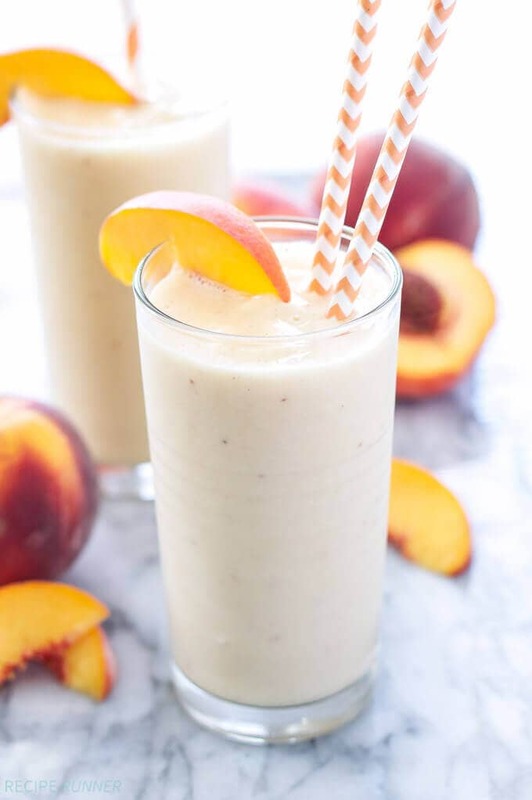 The sweetness of the peaches is tempered by the green tea’s earthiness and the creamy unctuous yogurt, creating a perfectly balanced and super-good-for-you treat. Attention chocolate and coffee lovers — here’s a protein shake with your name on it. This recipe makes an eye-opening breakfast that’ll get your focus sharpened and your blood pumping hard. Need a midday boost? It’s the perfect remedy for those afternoon blahs. Rich flavors and nourishing ingredients with a caffeine kick — sounds like a plan. All kinds of berries mingling together in a purple glass of yum — what could be better than a smoothie with the same ingredients as a berry crumble? The nutrients of the oats and the goodness of the yogurt share the stage with the vitamin rich berries, creating a healthy smoothie performance worthy of a standing ovation. So you stayed up too late last night and have a full day looming ahead of you. Here’s the solution — the Wake Me Up Coffee Smoothie. That’s right … a coffee smoothie. Coffee plus nutrition equals a perfect remedy for what ails you. A few sips and you’ll be awash in rejuvenating, body-good ingredients packing a caffeine buzz. 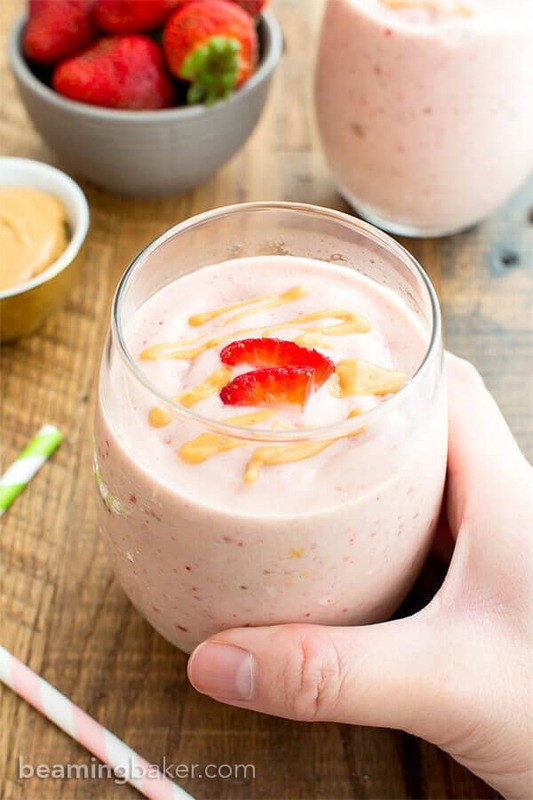 Anyone will tell you that strawberries and bananas make a perfect pairing for a smoothie, but when you toss in a few oats and a kiss of honey, you’ll upgrade it into something seriously special. It’s pink and sweet and oh so wholesome and might just turn into one of your go-to smoothies. 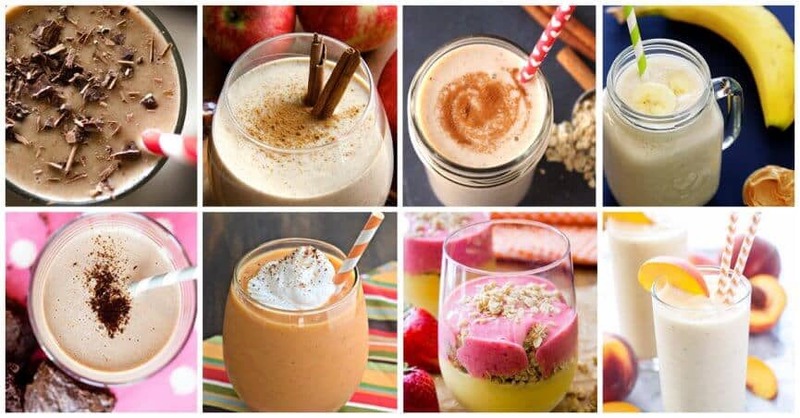 Being on a smoothie diet shouldn’t mean you have to miss out on those comfort food favorites. Solution? 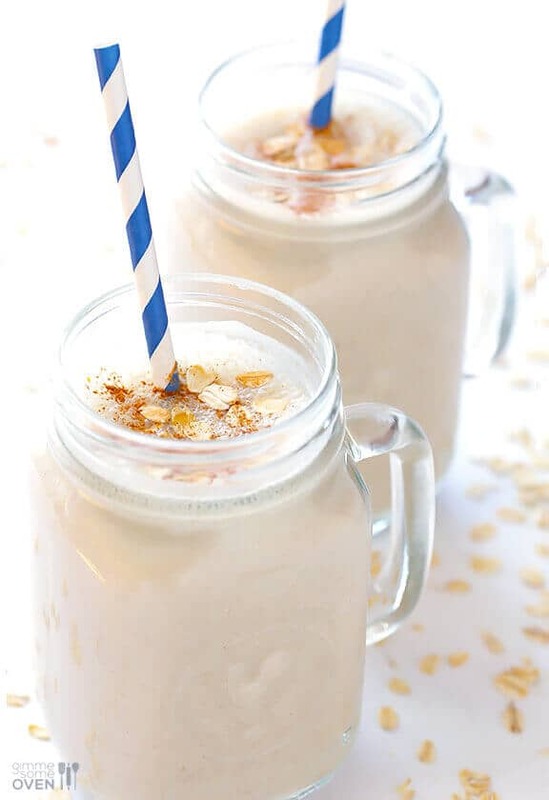 The banana bread smoothie. The warm spices and banana wholesomeness are the perfect cure for those healthy diet blues. One sip and you’ll feel like you’ve slid to the unhealthy dark side, all while treating your body like the temple it is. What’s easier than grabbing a quick blueberry muffin for breakfast? Yeah, sure, and if it wasn’t for all the carbs, fat and refined sugar, that’d be just the thing to do on a busy morning. 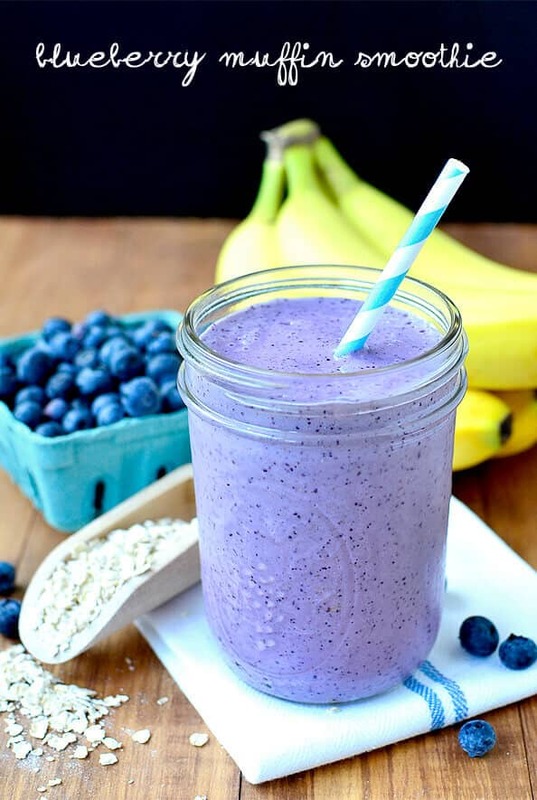 Instead, how about blending up a blueberry muffin smoothie? It has got all the blueberry scrumptiousness in a miraculously sippable form. Craving a light and refreshing fruit smoothie? Grab some raspberries and bananas, blend up one of these babies and then sit back and enjoy the cool vitamin ride. A little tart, a little sweet and all healthy, this smoothie will leave you satisfied and ready to take on the day. As smoothie recipes go, this one’s a real keeper. Cool, refreshing and light, this smoothie hits all the marks for something that’s truly addictive. The mango offers an unexpected punch, both tropically tart and a little sweet, only to be tamed by that familiar banana. The best part? The amazing color — it’s like drinking a glass of sunshine. You can have it all in 2018, and that includes a delectable coffee smoothie, guaranteed to get you charged up enough to tackle anything that comes your way. People with be diving out of your path as you storm through your day, jazzed up on this super high octane brew. Let ‘em run … boring smoothies are so 2017. You know those smoothies that to fill you up for a few minutes but leave you hungry only a little while later? This isn’t one of them. This baby is nutritious and filling, and oh by the way, it’s really, really good! Try out this thick, chocolaty, peanut butter fun-fest and consider making extra for your friends. How could a smoothie this decadent actually be healthy? Stop the presses, folks, you’ve found something special. This smoothie is all natural and all good. It doesn’t actually contain caramel, but could fool even the most discerning sweet-toothed aficionado. Take a sip and you’ll swear you can feel the crisp autumn air swirling around you. Hey vegans, it’s breakfast time! 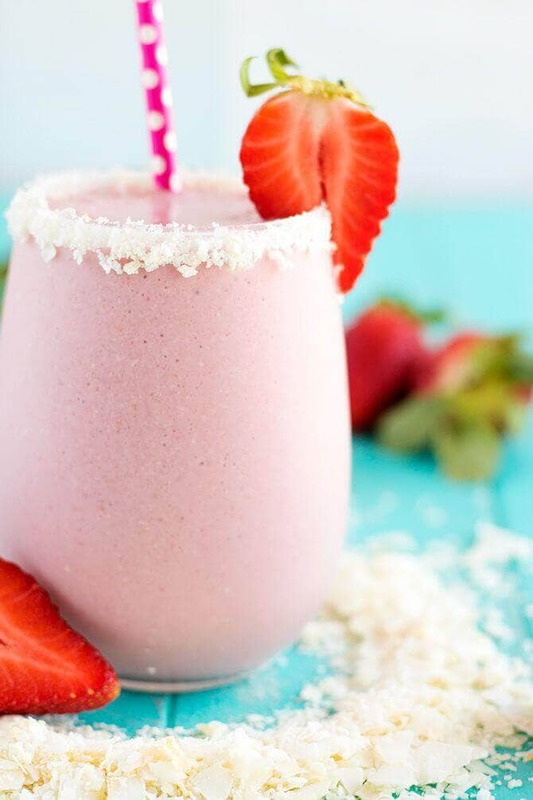 Instead of wolfing down a bowl of oatmeal followed by a bowl of strawberries, why not combine them into a tasty smoothie? This one’s pink and pretty as a picture, not to mention filling and crazy healthy. You don’t even need to be a vegan to add this smoothie to your list. Now we’re talking. 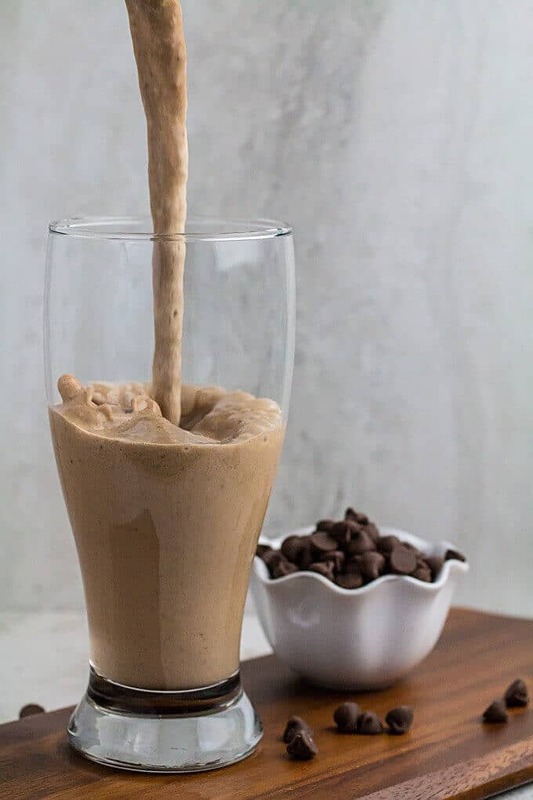 This chocolate-peanut butter dream is so rich, so decadent and so sinfully good, you’ll never believe it’s actually a healthy shake. It’s made from ingredients you probably have on hand, so grab your blender and you can whip one of these bad boys up in under 30 seconds. Okay, seriously, this smoothie wins the contest for the most gorgeous breakfast beverage at the party. It sports two contrasting layers of yumminess, both guilt-free, delicious and super healthy. It’ll be your very own smoothie sunset. Want to have fun? Invite some guests and make a whole slew! Your culinary prowess will never be questioned again. Who doesn’t love carrot cake? The spicy sweetness, those shreds of fresh carrot and the creamy-dreamy frosting, but alas, it’s packed with calories and refined sugar! Never fear, smoothie lovers, the wonder of carrot cake is here. This smoothie transforms carrots and oats into luscious goodness, but the real secret genius is in the cinnamon, nutmeg and ginger. This healthy breakfast smoothie recipe is a tasty, nutritious way to start your day. The chia seeds provide texture. The mango adds a tropical zing. You’ll feel like you’re on an island vacation with this delicious healthy recipe. If you’ve wanted to try adding greens to smoothies but haven’t been sure about the flavor, this is a great introduction. 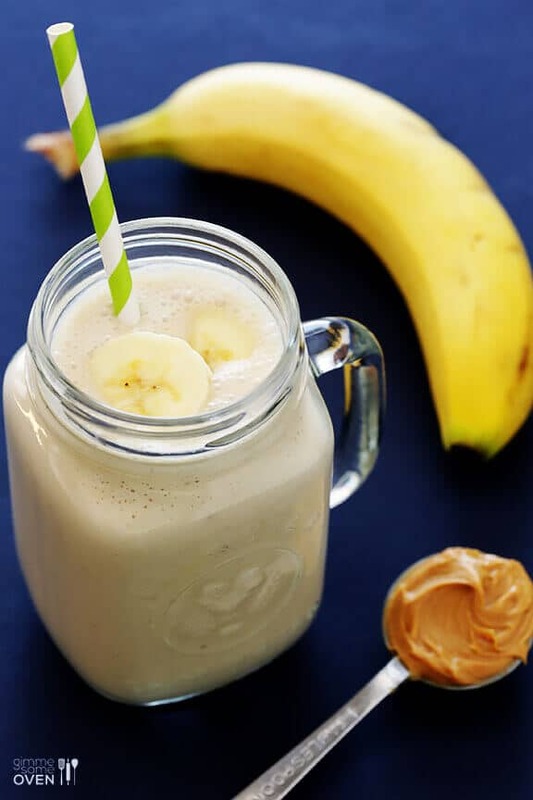 As with many other healthy breakfast smoothie recipes, bananas and peanut butter provide this smoothie its foundation. The spinach adds nutrients and a mild enough flavor to not overwhelm your taste buds. Top this veggie smoothie with chia and hemp seeds, raw buckwheat groats, and slivered almonds for added umph. Requiring few smoothie ingredients, this simple recipe is a great way to start your morning. Adding to the convenience, you can make this as either a fresh or frozen fruit smoothie. This is a good breakfast that’s quick and easy. It also makes the perfect afternoon pick-me-up. Decadent as dessert, this blender recipe is as delicious as it is nutritious. 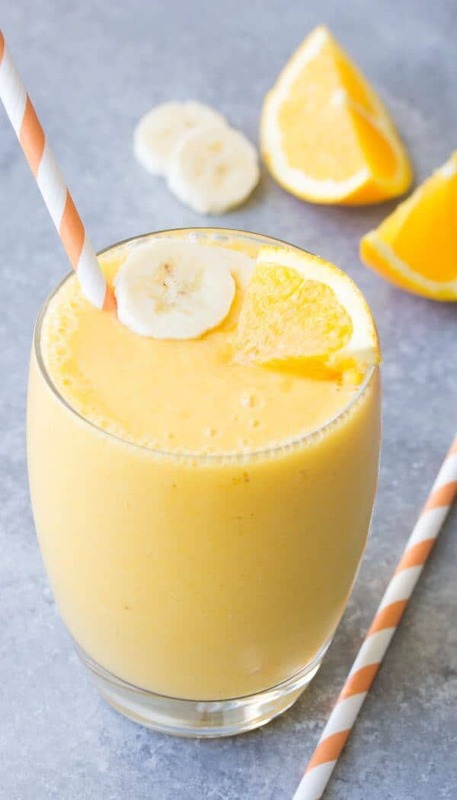 This is one of those healthy breakfast smoothie recipes that will give you the boost you need without feeling like you’re missing out. So go ahead and enjoy! Dessert helps to make life fun. What goes better with breakfast than coffee? And what goes along with coffee better than chocolate? 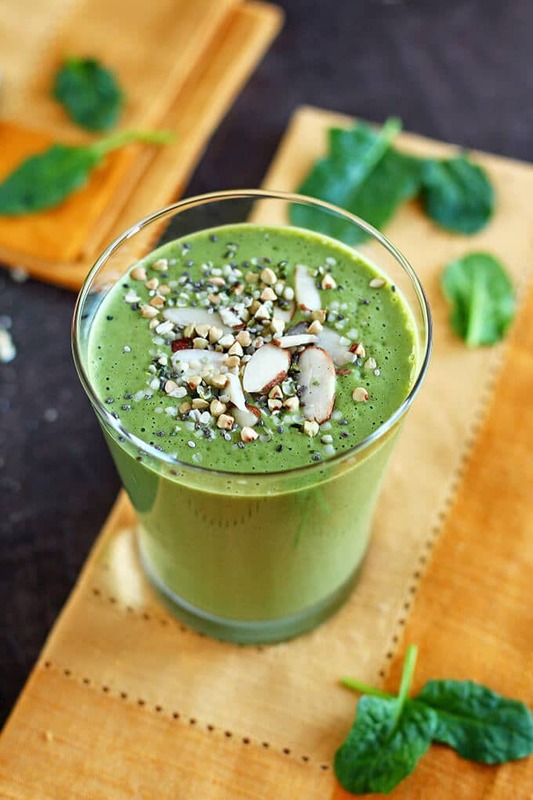 This energy smoothie recipe is both a breakfast and a morning latte all in one. Protein powder and almond milk help to make this smoothie recipe a hearty and filling start to your day. You won’t need anything else with this drink! Even though it may remind you of a milkshake or banana split, this morning smoothie is a filling breakfast. It’s chocked full of protein. 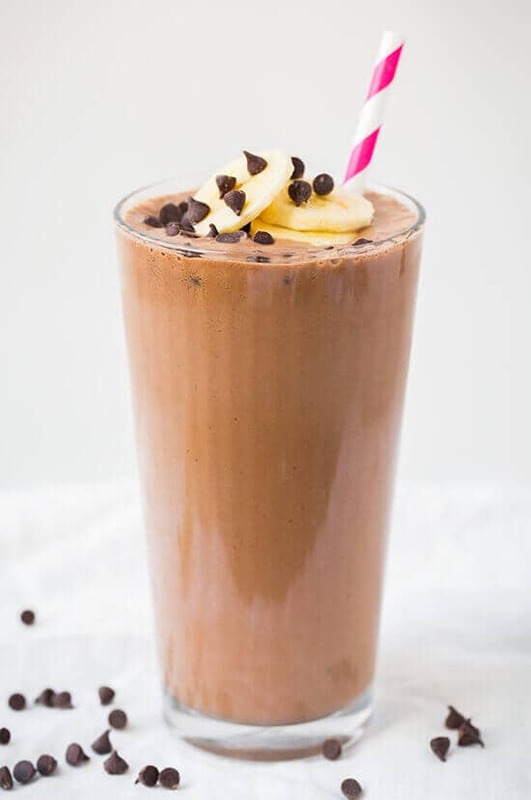 This peanut butter chocolate banana smoothie will give you plenty of energy to tackle your day. For some extra goodness, top it off with fresh, sliced bananas. If you’ve wanted some smoothie ideas that work for both breakfast and dessert, then this is for you. This healthy shake is sure to be your “birthday cake” of choice for 2018. But it’s good for more than just special occasions. With its combination of carbs and protein, this homemade smoothie is also an awesome post-workout snack or meal supplement. 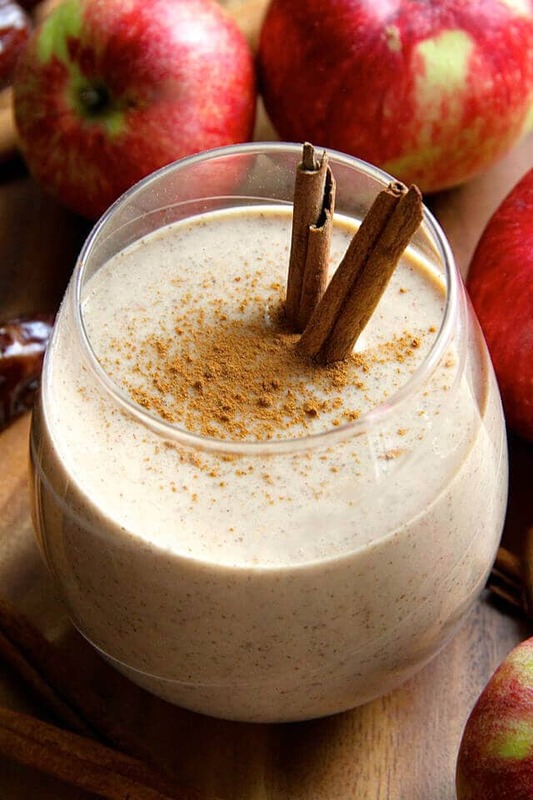 Seasoned with cinnamon and fortified with oats, this smoothie is good for both body and soul. Out of all the healthy breakfast smoothie recipes, you and your kids (if you have any) will keep coming back to this one. With simple ingredients and satisfying flavors, this morning smoothie idea is one of the best things you could add to your menu. This healthy fruit smoothie recipe is simple to make. It has few ingredients and relies on one in particular to add a unique punch of flavor: toasted coconut almond butter. The toasted flavor carries well in this yogurt smoothie. It’s an awesome combination you’ll start to crave once you try it. I know what you might be thinking, this doesn’t sound like one of our healthy breakfast smoothie recipes. Cauliflower is actually a great way to thicken and fortify smoothies, even breakfast smoothies. It blends with the chocolate and the raspberries and imparts just enough flavor, without being overwhelming. Try it for yourself. You won’t be disappointed. The frozen blueberries and shredded beet create not only a delicious healthy recipe but a pleasantly colored one as well. Beets are naturally very sweet and pair well with fruits. This vegetable smoothie recipe also calls for a splash of lime to give it that extra kick of acidity. This is one of our healthy breakfast smoothie recipes that is sure to surprise and delight. Rich in vitamin D, this healthy fruit smoothie recipe is a great alternative for your morning cup of coffee. As an energy smoothie recipe, it will give you a boost without the crash. 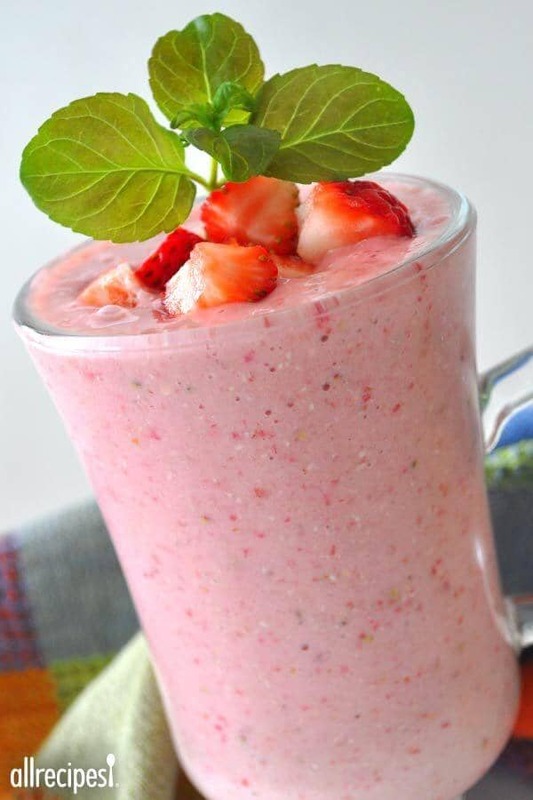 It can be made as either a fresh or frozen fruit smoothie. Plus, the layered presentation is fun and easy to replicate. It will surely impress both family and guests. Have you ever had cookies for breakfast? 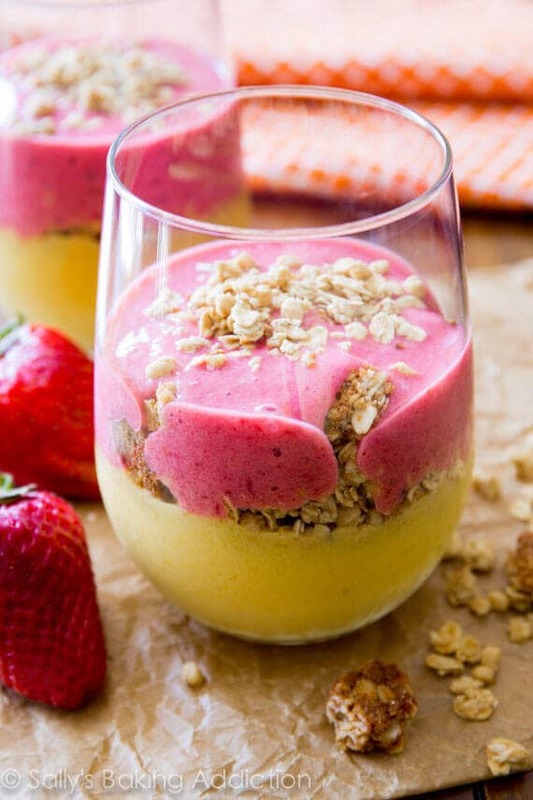 Here’s another of our smoothie ideas that offers you dessert flavors without the guilt! 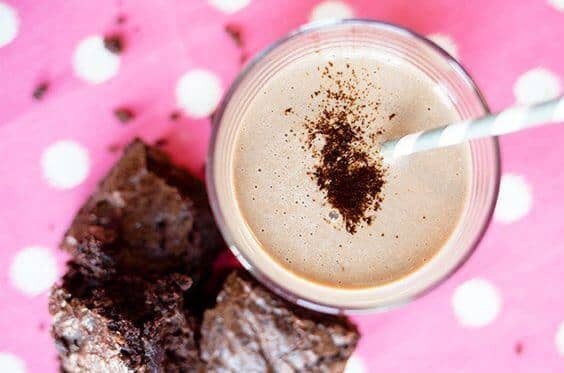 With bananas, peanut butter, cocoa powder, and almond milk, this is a healthy, protein smoothie recipe that allows you to indulge your sweet tooth. 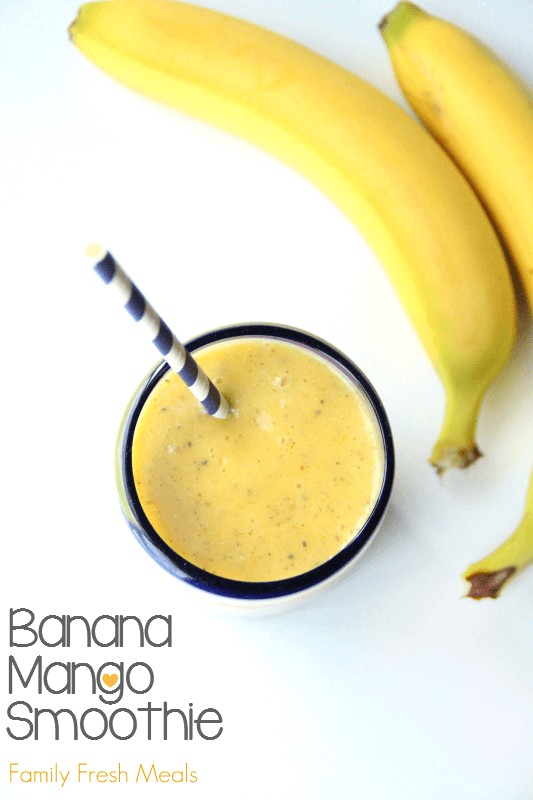 Great for breakfast or as a snack, this smoothie is worth trying. 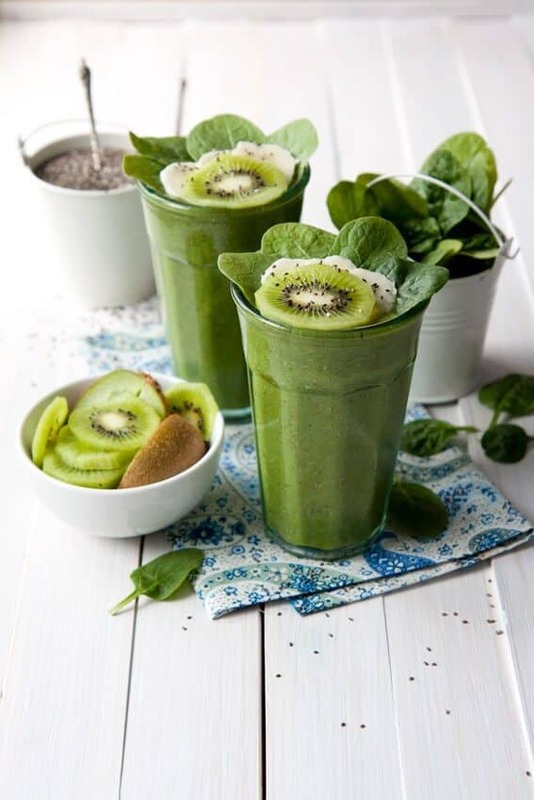 This healthy green smoothie is both delicious and contains a wide array of healthy components, including vitamin K1, A, C, B6, and Omega 3 fatty acid. Try adding this vegetable smoothie idea to your menu if you have trouble eating your daily recommended dose of greens. 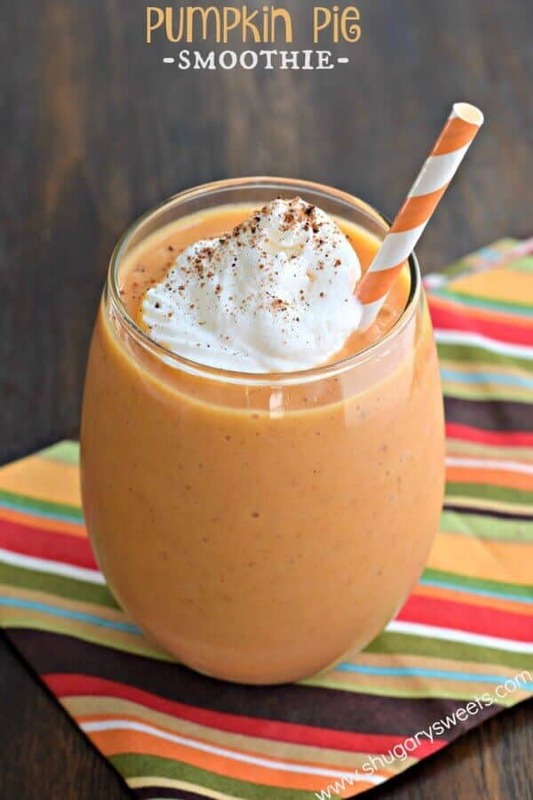 The fruit gives this veggie smoothie a nice light flavor, and it will help you to feel your best. When you’re not feeling well, this is one of our healthy breakfast smoothie recipes you should keep in mind. 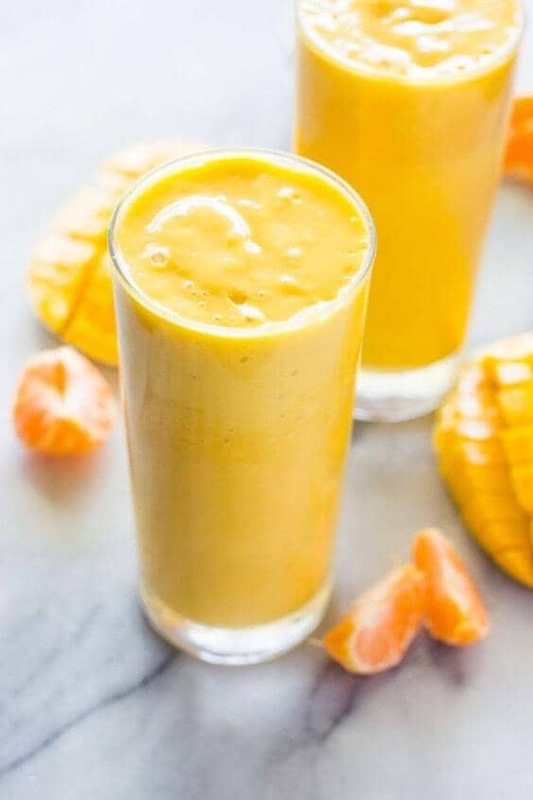 This smoothie recipe is rich in vitamin C. It will assist your immune system and prevent against a host of other health problems. Homemade smoothies are an easy way to make sure your body is getting everything it needs to stay well. This pairing creates a colorful and delicious smoothie. The smooth flavor of avocado with honey rounds out the tartness of the strawberries. While fun, the layers also allow you to enjoy both fruits separately. 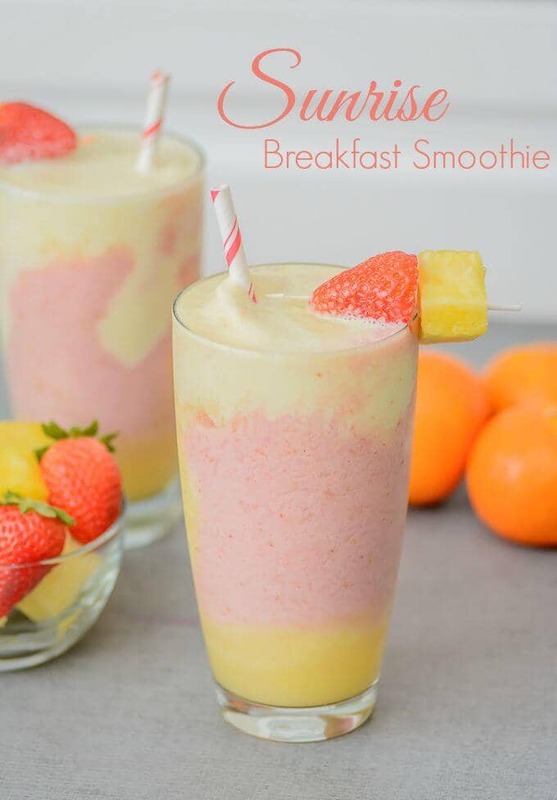 This is also one of our healthy breakfast smoothie recipes that you can personalize by substituting the strawberries with other fruit. 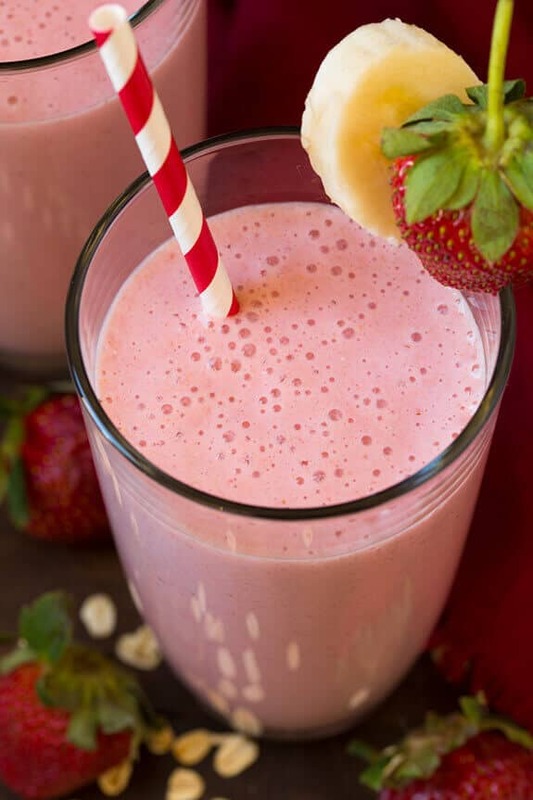 Every day of 2018 can by Valentine’s Day with this breakfast shake. It’s perfect for any time you want to treat yourself or your sweetheart to something decadent, tasty, and healthy. The delicious unsweetened dark cocoa powder contains flavonoids. Flavonoids can help to reduce inflammation. 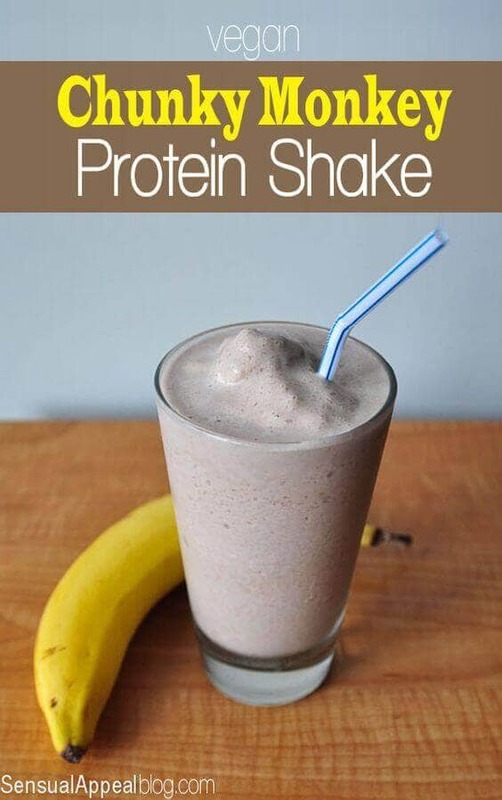 This is a healthy shake you can and should indulge in. 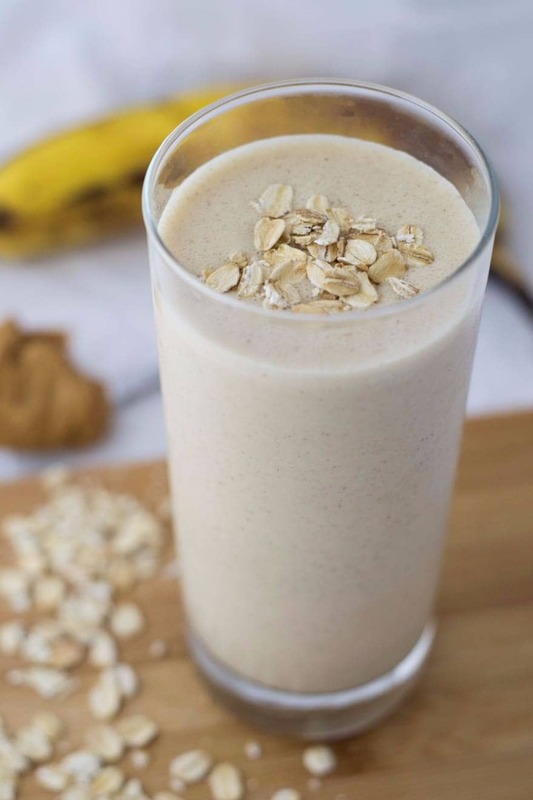 Peanut powder can be a great substitute for peanut butter in any protein smoothie recipe. It has the same amount of protein but contains less sugar and 85% less fat. Another bonus, you can’t taste the difference. 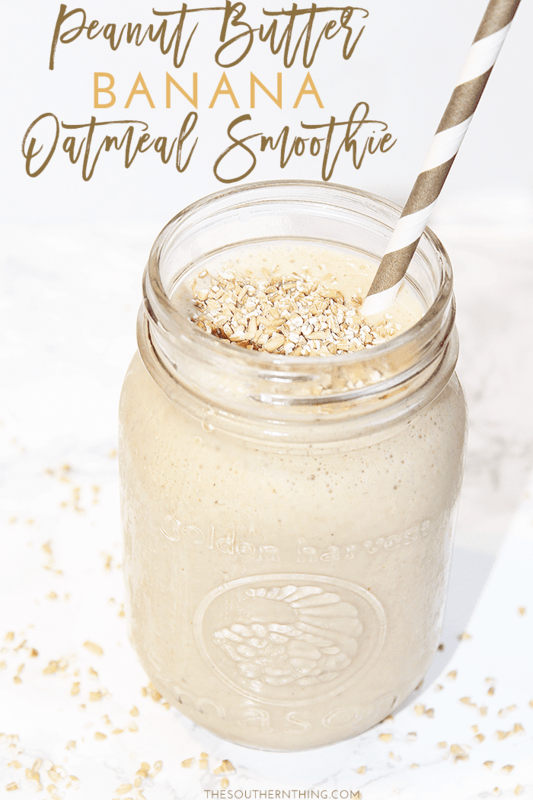 This oatmeal smoothie is one of our healthy breakfast smoothie recipes that help you take control of your diet. 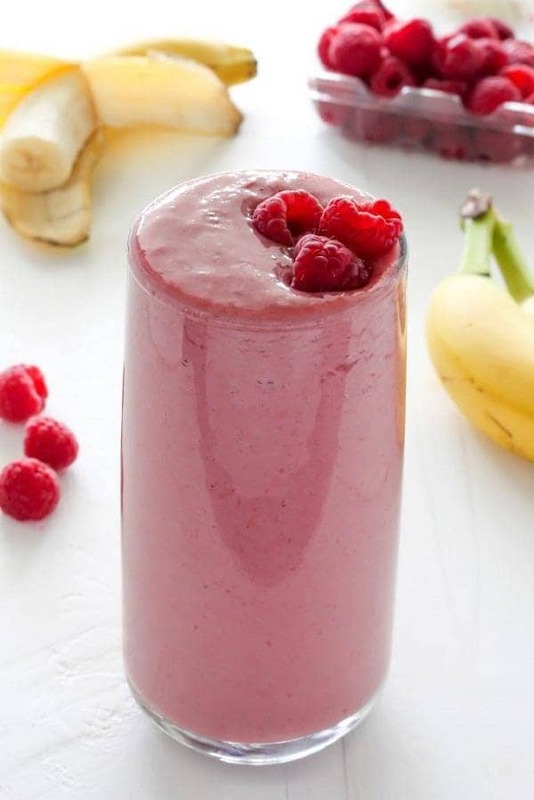 This fruit smoothie is a great way to start the day. You won’t need the caffeine with the zest and citrus of the mango and orange. Place all of the smoothie ingredients into a blender and go. All healthy breakfast smoothie recipes should be this simple to make and this easy to enjoy. 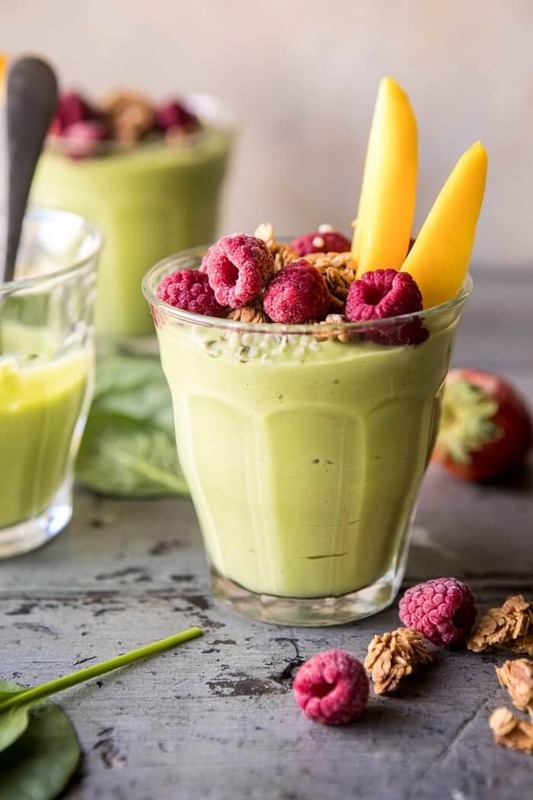 Filled with healthy fats, nutrient dense foods, and sweetened with bananas and mangoes, this is one healthy green smoothie. You can even make this recipe ahead of time. Place the prepared ingredients in a bag and keep in the freezer for up to three months. When ready, blend to have a fortifying breakfast shake. Personalize this recipe by adding toppings like fresh fruit and granola. This berry smoothie recipe has the same wholesome flavor as a blueberry muffin. Enhanced with vanilla, cinnamon, and honey, this recipe makes a good breakfast staple. As healthy breakfast smoothie recipes go, this one is quick, easy, and delicious. Place all the ingredients into the blender and then enjoy. Nothing beats the convenience of blender recipes. Ready to Make your Favorite Smoothie? 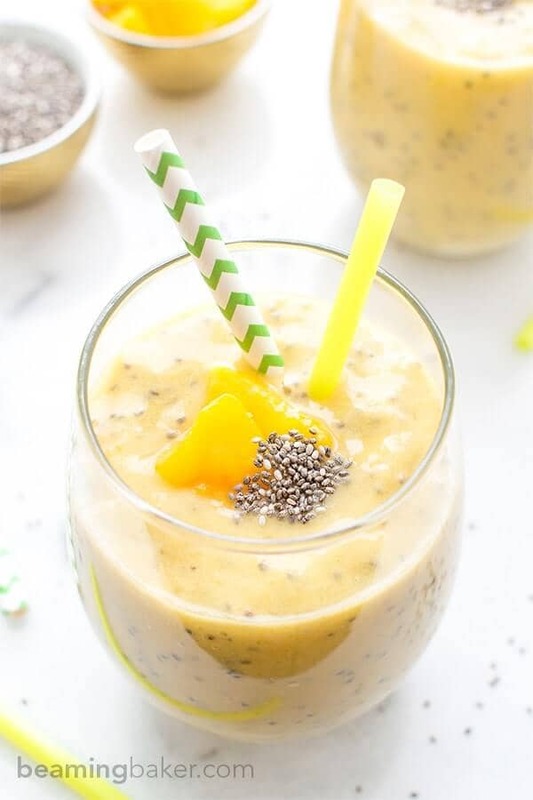 Whatever your tastes and preferences might be, or what mood you are in as you begin your day, there is a breakfast smoothie recipe for you. That’s the beauty of having smoothies first thing in the morning. They can be healthy or indulgent, simple or sophisticated, energizing or comforting. A wonderful smoothie recipe for breakfast is a delightful way to begin your day, every day. Enjoy!